A 64-gallon cart with a black lid is provided for your garbage/refuse for weekly collection. Trash must be bagged before placing in your refuse cart. A second 64-gallon cart is available upon request. Large car parts, tires, batteries, etc. Proper cart placement is very important to allow our workers to collect your refuse and recycling efficiently and safely. When setting out carts for collection be sure to place them within 3 feet of the curb and at least 5 feet apart; place the wheels towards your dwelling with the lid closed; place carts out no earlier than 12PM on the day before collection and no later than 6AM on collection day. Residents needing large trash collection services shall make an appointment for a pickup. Appointments must be scheduled by noon on the Friday prior to the week of the pickup. Each residential property is entitled to two (2) scheduled free large trash collections per year of up to four (4) cubic yards (12′ long x 3′ wide x 3′ high) each. Refuse must be placed in such a way that it can be readily loaded by the refuse crew. Small items or loose refuse needs to be bagged, bundled or otherwise put in containers. Materials prohibited from regular collection are also prohibited in special collections. Residents can request a temporary 6-yard dumpster. Dumpsters will be provided subject to availability, provided that the City can deliver, service and remove the dumpster without damage to trees, buildings and overhead wires. Dumpsters must be placed on an improved, hard and level surface such as gravel, asphalt or concrete. Payment is required in advance. Corrugated Cardboard Recycling: Cardboard dumpsters are available for customers who generate a significant amount of corrugated cardboard. Mixed, Single Stream Recycling: Recyclable items are placed together. No sorting required. Using a combination of 64 and 96-gallon carts and/or 2-yard, 4-yard and 6-yard rear load dumpsters, the City is implemented a single stream recycling collection for all of our commercial refuse customers. The type, size and quantity of containers as well as the service schedule will be based on the needs of each customer. Recycling Carts: The City provides 64 and 96-gallon, blue lid carts for recycling. Cart serial numbers are recorded for inventory control. Carts remain the property of the City. Lost or stolen carts may become the property owner’s responsibility. A recycling label has been affixed to the inside lid of the cart identifying acceptable recyclables. Recycling Dumpsters: Available for commercial single stream recycling in three sizes. Corrugated Cardboard Only dumpsters are also available. 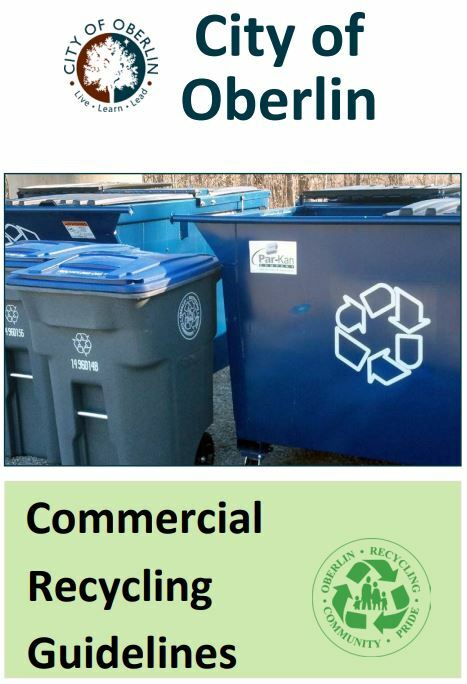 Technical assistance in planning and implementing commercial recycling programs is available by contacting the Recycling Coordinator at 440-935-0096. We look forward to providing expanded recycling services at your location! Applications for services can be found below.